Increase production with automatic door loading of your RUVO 9696 with the RUVO 2002s Automatic Steel Door Loader. 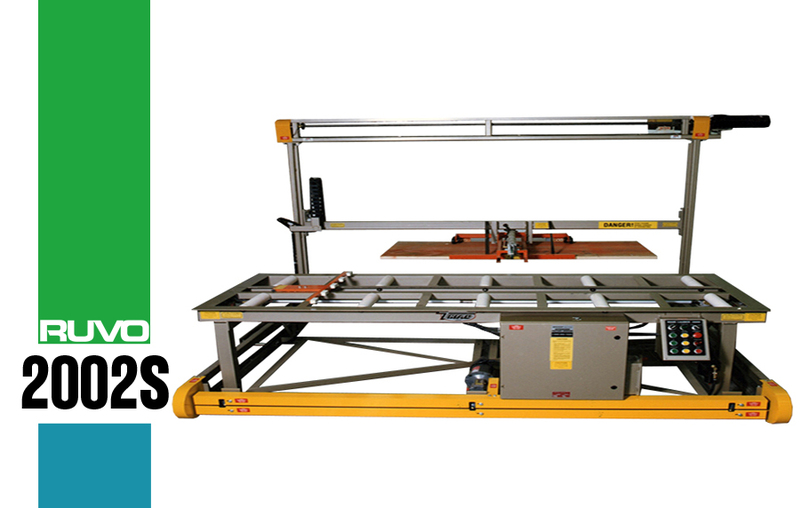 The RUVO 2002s Door Loader is designed to be used in conjunction with the RUVO 9600 XY Templateless Door Lite Cutter for the RUVP 9696 Door Lite Cutter. The machine picks up exterior doors by the house lot and places them on skids to be moved into position. Next the machine gently lifts a door from the top of the stack and places it on the input table ready for processing. Upon receiving a signal from a processor, the loader automatically injects a door onto the input table simultaneously ejecting the previously processed door. The gantry then prepares to lift another door. A smooth, precise, trouble-free gantry operation is achieved by using heavy duty dual chain drive mechanisms. The 2002s loader employs a mar-proof clamping system, which automatically adjusts to almost any exterior door size or type. Stack Capacity: 6'8" - 8'0"
Door Size: 2-1/2" - 10-1/2"